Jesse Vassallo joined the Hurricanes' swim team in 1981 as one of the most successful swimmers in the country. 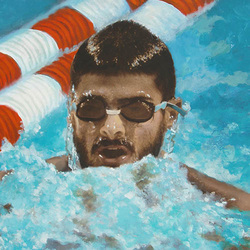 He won his first race in the 400 individual medley at the age of 15 and did not lose a race for five and a half years, winning twenty major titles and setting three world records before he turned 20 years of age. Jesse captured a National Championship title in the 400-meter individual medley in 1981, and still holds the team record for the 200-meter individual medley (1:48.07) and the 400-meter individual medley (3:48.16). Jesse suffered a career-threatening knee injury in June of 1982, made an astonishing comeback a year later, and was named to the 1984 Olympic team. During his career, Jesse was a two-time All-Amerian, in 1981 and 1982 and was selected for the Pan-American team and was a member of the 1980 Olympic team.